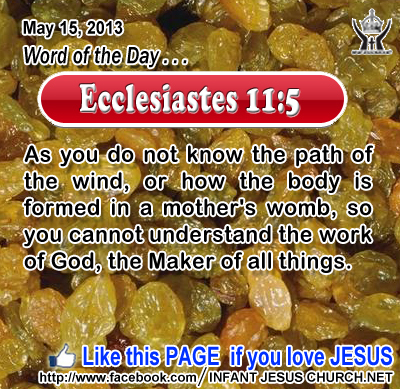 Ecclesiastes 11:5: As you do not know the path of the wind, or how the body is formed in a mother's womb, so you cannot understand the work of God, the Maker of all things. O Lord God, we can only offer our wonder and awe. When we consider the immensity of the universe in which our tiny blue planet spins its survival, we are humbled at your magnificently complex and expansive sovereignty. At the same time, Heavenly Father, we treasure your nearness. You are the good far above all we know, the God who transcends space and time, and also God our Father who is ever near. Thank you for being accessible but not penetrable, available but not controllable. We thank you and praise you in the name of Infant Jesus. Amen. 11And now I am no more in the world, but they are in the world, and I am coming to you. Holy Father, keep them in your name, which you have given me, that they may be one, even as we are one. 12 While I was with them, I kept them in your name, which you have given me; I have guarded them, and none of them is lost but the son of perdition, that the scripture might be fulfilled. 13 But now I am coming to you; and these things I speak in the world, that they may have my joy fulfilled in themselves. 14 I have given them your word; and the world has hated them because they are not of the world, even as I am not of the world. 15 I do not pray that you should take them out of the world, but that you should keep them from the evil one. 16 They are not of the world, even as I am not of the world.17 Sanctify them in the truth; your word is truth. 18 As you did send me into the world, so I have sent them into the world. 19 And for their sake I consecrate myself, that they also may be consecrated in truth. Jesus prayed that his disciples would be sacred and consecrated in God's truth and holiness. The scriptural word for sanctification comes from the same Hebrew word which signifies holy or set apart for God. This word also means to be equipped with the qualities of mind and heart and character for such a mission or service. Just as Jesus was called by the Father to serve in sanctity and truth, so we, too, are called and prepared for the task of serving God in the world as his ambassadors. God's truth frees us from unawareness and the deception of sin. It reveals to us God's goodness, love, and wisdom. And it gives us a desire for God's holiness. The Holy Spirit is the source and donor of all holiness. As we allow the Holy Spirit to work in our lives, he changes us by his purifying fire and changes us into the likeness of Jesus. Is our life consecrated to God? Loving Infant Jesus, take our life and make it wholly pleasing to you. Sanctify us in your truth and guide us by your Holy Spirit that we may follow you faithfully wherever you lead.